(Logan, UT – January 18, 2019) — Altra signed world champion obstacle course racer Amelia Boone to its Elite Team. Boone has won the Spartan Race World and Toughest Mudder championships, is a course record breaker and top finisher in the ultrarunning world, and works as a full-time lawyer for Apple. Boone got her start in obstacle course racing in 2011 when she signed up for her first Tough Mudder, thanks to the persuading pleas of her co-workers. She placed second female and quickly fell in love with the sport. Since that race, Boone has amassed more than 30 first place finishes and over 50 podium finishes. Despite being a full-time professional athlete, Boone also has a demanding full-time career. She currently works as a corporate attorney for Apple and previously at the renowned law firm Skadden, Arps, Slate, Meagher & Flom. Because of her dual career, she’s up at 4am to run trails, then heads to an eight hour+ workday and finishes up with an evening strength training or mobility workout. After her busy week, she spends most weekends traveling and competing at races. Although she dominates the OCR world, Boone is making a name for herself on the ultrarunning scene. In 2018, she was first overall with a course record at Mt Umunhum 34k and competed in the legendary Barkley Marathons. 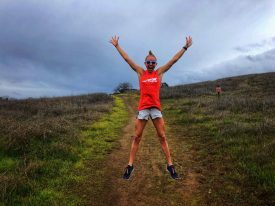 In 2017, she was first female and second overall at both the Rodeo Beach Half Marathon and the Saratoga Trail Half Marathon. In 2016, she was second female at the Sean O’Brien 100k and first overall with a female course record at the Woodside Crossover 50k. In 2015, she was first female at the Rodeo Beach 30k, first female at the XTERRA McDowell Mountain 15-miler and third female at the Georgia Death Race 68-miler. As a new member of the Altra Elite Team and representing Altra’s Fit4Her™ campaign—Altra’s female specific shoe technology—Boone has some big plans for 2019. Along with racing multiple Spartan races, she plans to compete in her first 200-miler at Bigfoot 200 in August and at Big’s Backyard Ultra, a race where competitors run a 4.16 mile loop every hour until only one is left standing. Boone’s current favorite Altra shoe is the Timp 1.5 because of its versatile nature. With a 29mm stack height, the Timp has plenty of cushion for long miles, yet is super nimble on the trails. Follow Amelia Boone’s OCR and ultra running successes along with all of Altra’s athletes on its Elite and Red Teams by following the Team Altra Facebook page.